or One Monthly Goal with Elm Street Quilts... from over HeRe. In the month of February my goal is to make 2 more "spool" blocks. That is a cute spool quilt. Going away? Have fun! Good luck with your OMG. Good goal. 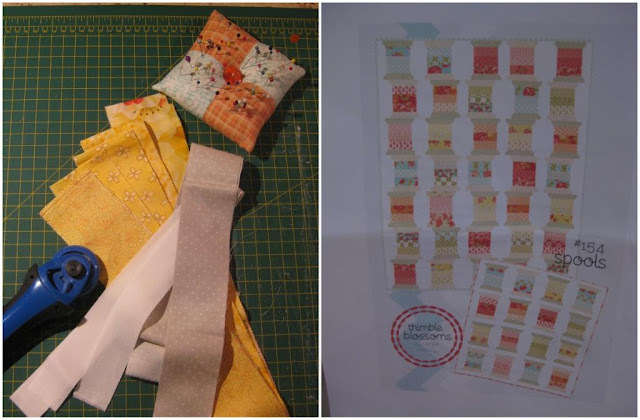 Thanks for linking up with Elm Street Quilts and good luck on your project! I'm sure you'll get the Spools done before your next trip.. Where this time?? have fun!! Rah! Rah! Goooooooooo, Cheryll! (That's me rooting you on!) Have a fabulous vacation! Hola Cheryl! Que linda iniciativa! Me gusta mucho tu blog porque nos sirve de inspiración. Recibe un fuerte abrazo desde Venezuela!! !